The Fall Gardening season is fast approaching and the garden is full of weeds and dead or dying plants—depressing. Nothing to do but get out the gloves, hoe, pruners, a small spade or spading fork and clean it out. After an hour in the heat and humidity it seems like two hours, my clothes are wet with perspiration, I’m nursing a few fire ant bites and I’ve got four or five wheelbarrow loads to haul to the burn pile. Lots more cleanup and then it’s time to add a bunch of compost and Arbor Gate organic fertilizer and look forward to cool weather. I have to remind myself, “while you’re cooling off don’t despair—think “Salad Time”, fresh broccoli or cauliflower with butter and cheese sauce, greens cooked with bacon, onions and cider vinegar, Sugarsnap peas stir fried with Pac Choi, Chinese Cabbage and spicy marinated chicken bites”. I’m better now—cooling down, I know it’s worth it and I’ll take on another section of the garden tomorrow. While you’re planning your fall garden, plan to pick up some fiber row cover—and throw in a roll of frost blanket for the few cold snaps we have. 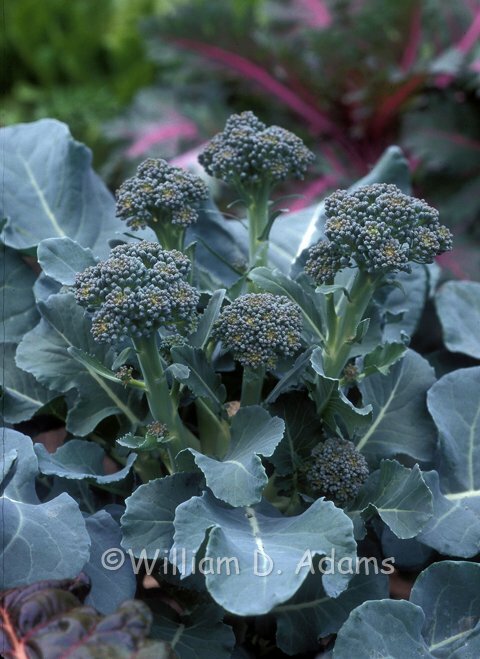 Make some hoops from black irrigation pipe and get your broccoli, cauliflower, etc., transplants off to a good start in the early fall heat under a row cover tunnel. 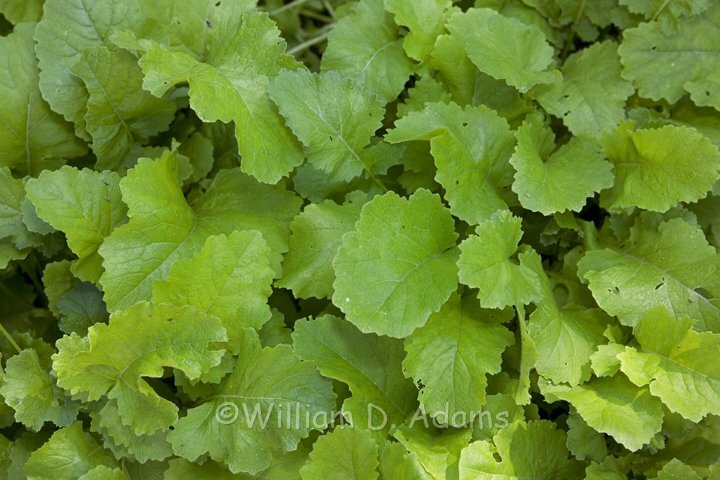 Birds can be a big problem with fall seedlings—we’ve had to grow radishes under row cover-start to finish. At the very least you may have to get seedlings up to the 4-5 leaf stage before they can survive the hungry sparrows. 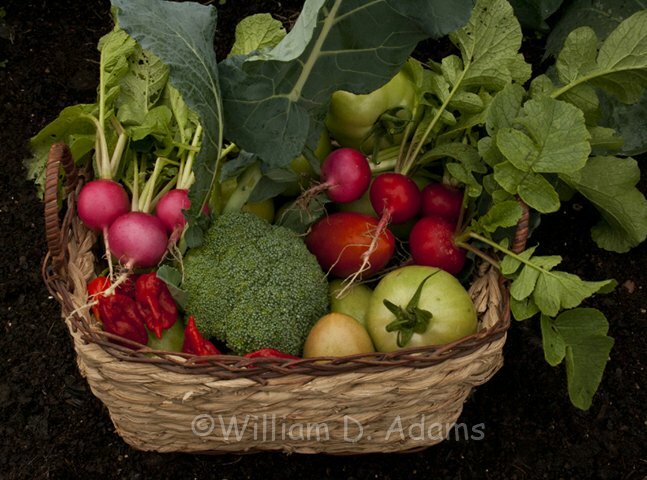 Otherwise the fall garden is a really easygoing and productive project that typically involves fewer pests, less intensive watering (you will have to do some), fewer, or at least, less invasive weeds and the potential for lots of production from root crops, greens, broccoli and more. 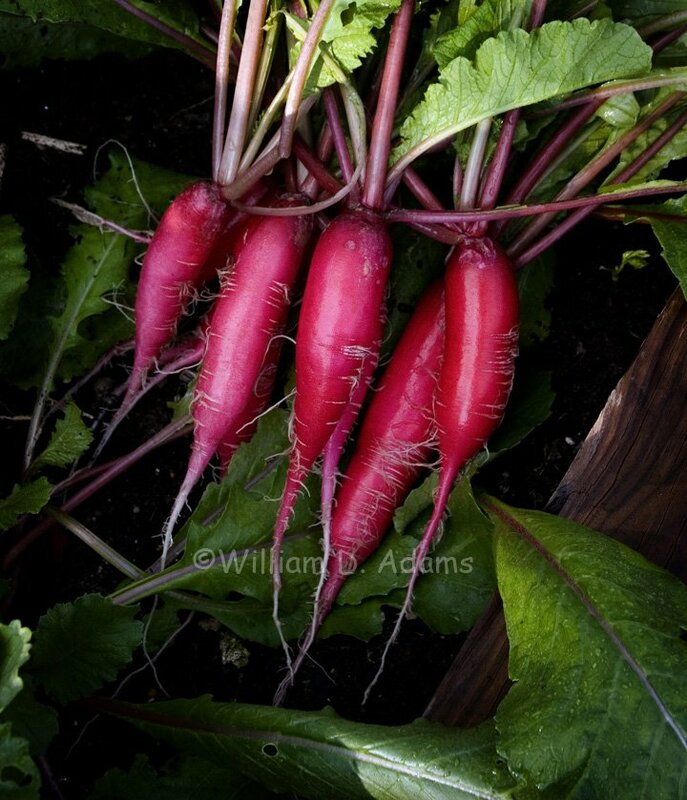 One of the easiest ways to categorize cool season crops is by growth type so let’s start with Root Crops. 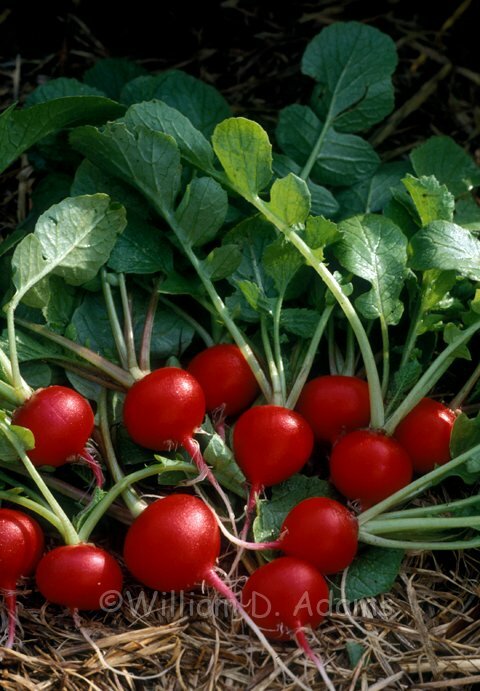 Radishes are an obvious choice—they are easy to grow, quick to germinate and the common red globes are ready in a month. 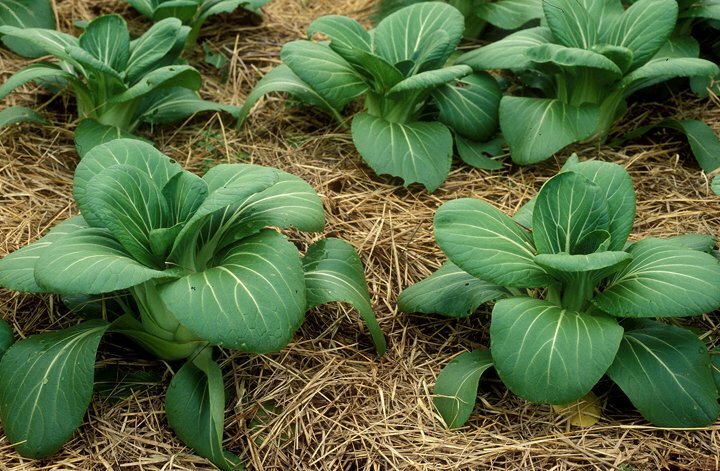 The following recommendations presume that you have cleaned out the beds, added fresh compost and a good complete fertilizer containing nitrogen, phosphorous and potassium and raked or tilled this into the beds. Try to not plant the seed too thickly; but if you do, thin them an inch apart within the first week after germination. If you have sparrows helping with the process, cover with fiber row cover. Water daily if it’s dry and begin foliar feeding with the first true leaves. A hose-on fertilizer sprayer is handy for this chore but you can do a great job with a watering can and soluble or liquid organic fertilizer. Now for the fashion show and a few comments regarding varieties. Cherry Belle is an old variety but still a good one. Actually you can count on any of the red globe radishes to produce in thirty days. Long varieties will take more time to mature- for example the red or white icicles should be ready in no more than 45 days. 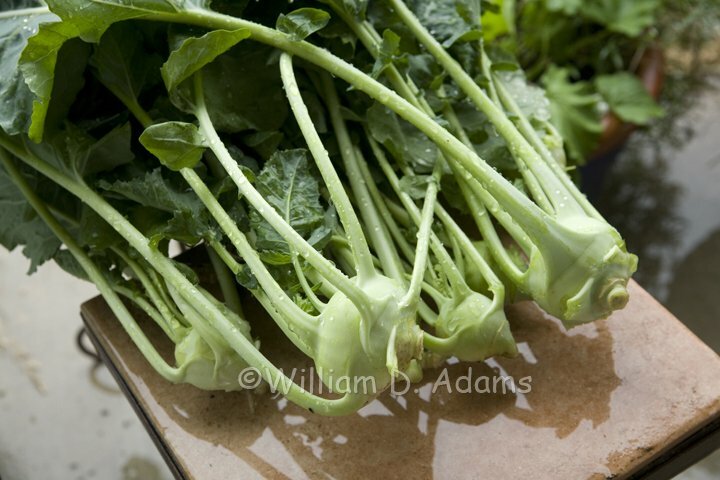 Asian radishes can take 60 days or longer. 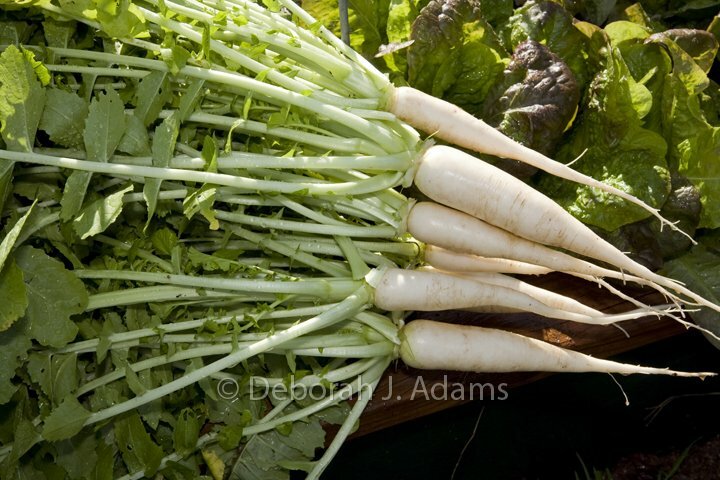 They vary from round 2- inch globes to long white daikon types that can be 2 or more inches in diameter and 12 inches or longer in length. 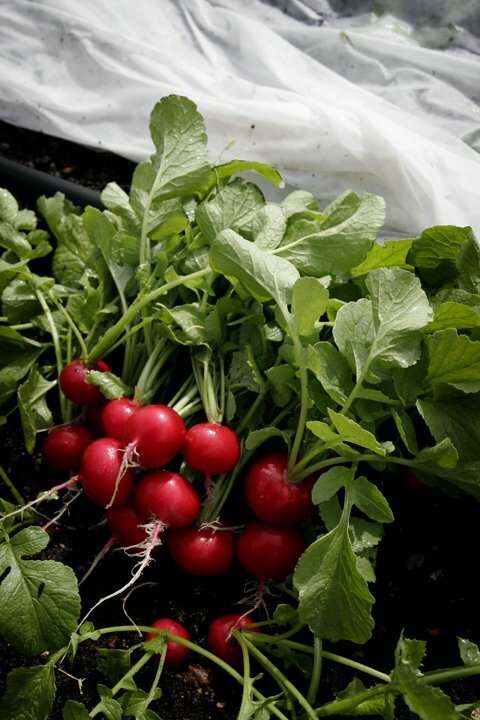 Plant a new row of the small radishes every week and have them all winter. Note they will need to be covered if a hard freeze is predicted. 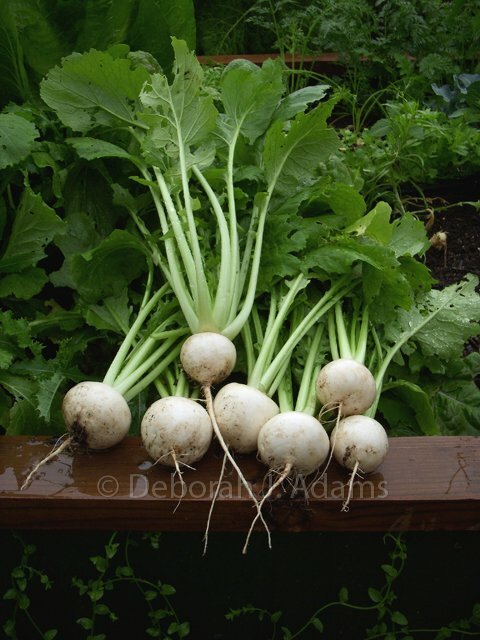 The small white Asian type turnips mature in about thirty days and they are tender and sweet—tasty, but not a radish though equally adapted to the cool season garden. 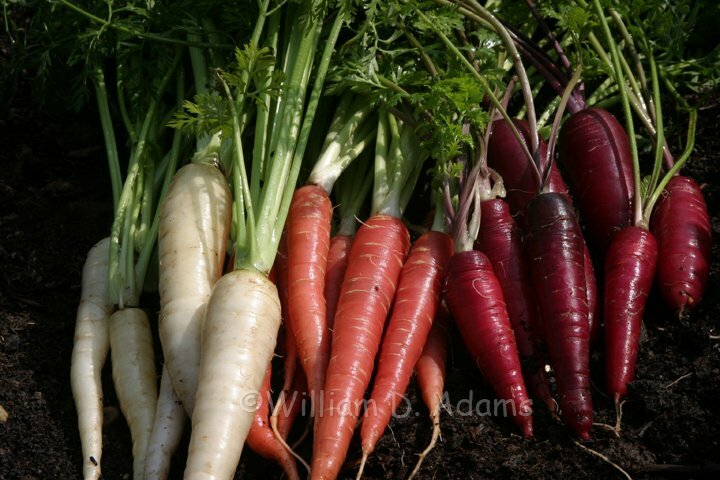 Carrots need a loose, organic soil to grow well so they usually thrive in a raised bed. The trick seems to be getting them to germinate. Be sure to start with fresh seed and lightly rake the seed into the soil. Keep the soil evenly moist until the seedlings are up and growing. If they come up too thickly it pays to thin them an inch apart or you may produce a lot of tops with skinny little roots. Carrots come in several shapes and colors. We concentrate on the ones touted as extra sweet—usually the red-orange or purple ones. The white ones are curious but not very good and, frankly, grocery carrots aren’t bad. Carrot production is a vegetable challenge you might want to put off if you’re a beginning gardener. Beets are a bit easier. The roots are an acquired taste for most folks but you may like the leaves even better. Beets may not have the level of family appeal that sweet corn garners in the summer garden, but they are good to eat and really good for you. 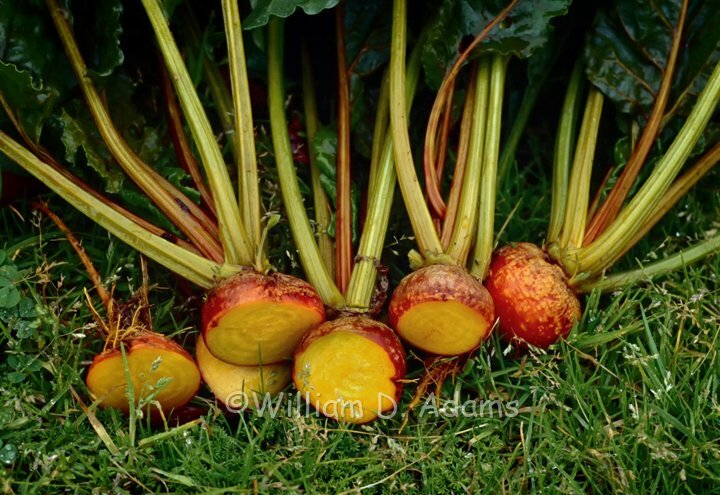 Most beets are red but they also come in a golden form (Burpee’s Golden) and a red and white striped version (Chioggia). 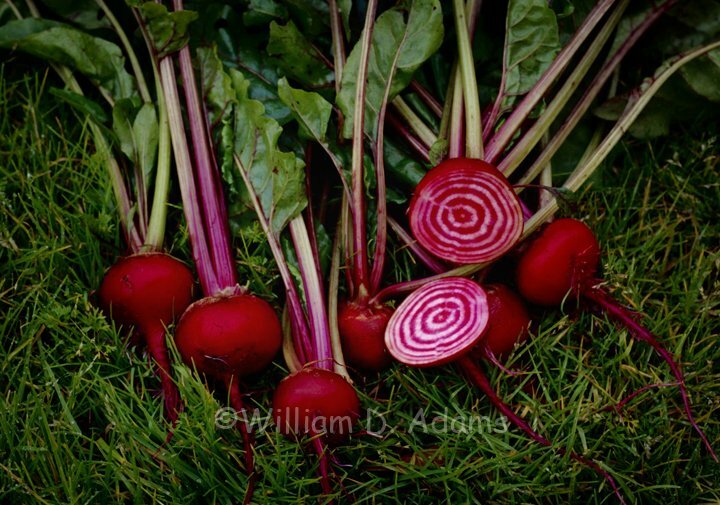 Beets are a close relative of Chard but with a beet, you can eat the whole plant. 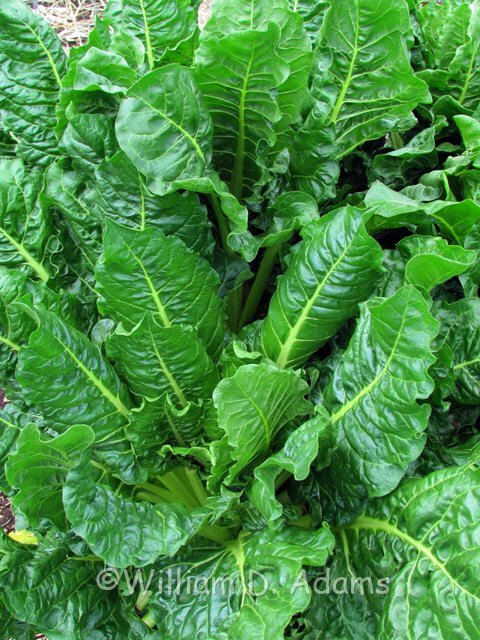 Chard roots are woody and tough but the leaves are bigger, tender and delicious! 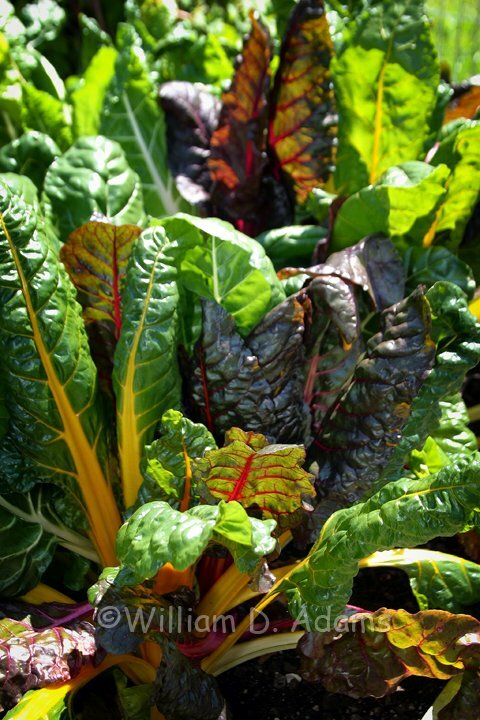 Verde da Taglio is an all green variety and family favorite but it’s also hard to resist the multi-colored varieties that look great in the winter flower bed or sautéed for the table. The typical cool season garden is lush with greens. 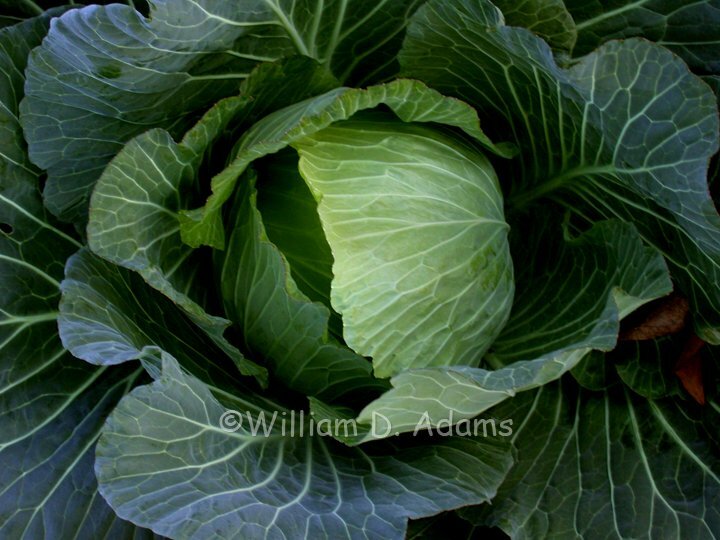 They are really good for you but it is often difficult to eat enough to ensure a fresh crop of tender young leaves. 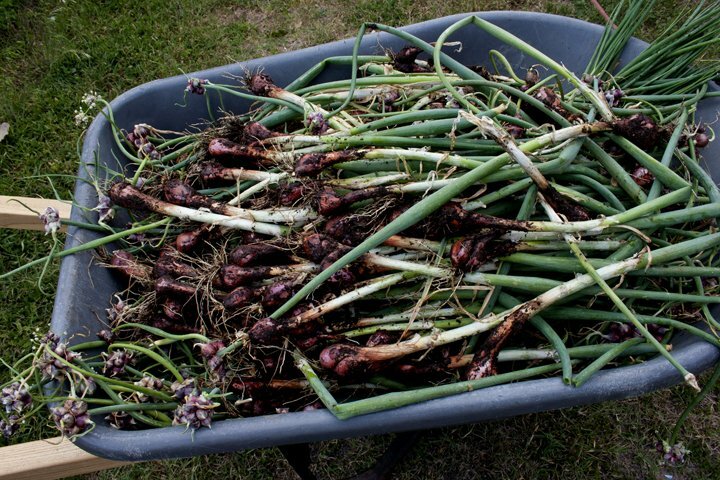 If you have to harvest a few for the compost pile that will keep them growing vigorously, better yet, take a bag to friends—maybe slip a favorite recipe in the bag too. 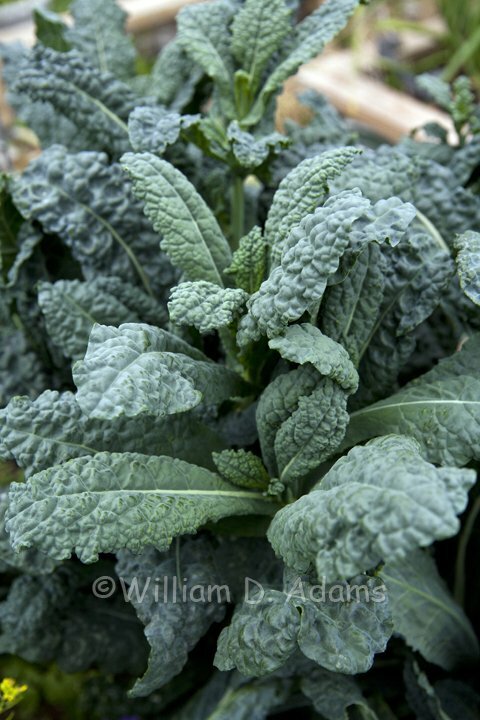 Kale has become the “darling” of many of the cooking show chefs and for good reason. 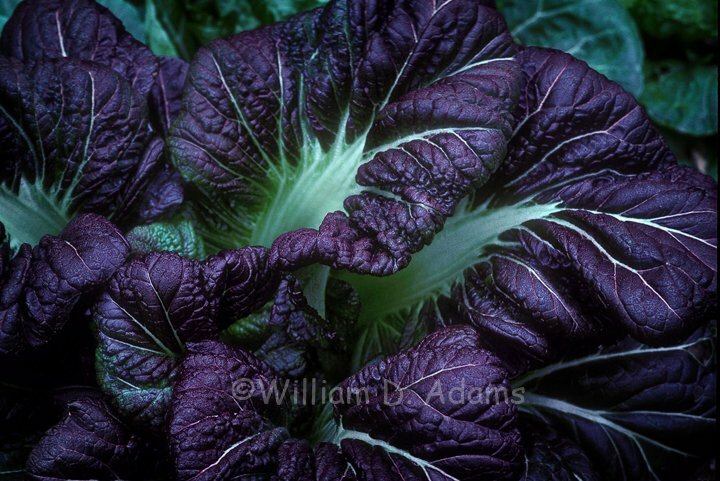 Think of it as a “frilly leaved collard” with elevated social status. We like it, especially the Italian Heirloom types because they are easy to grow, beautiful and the stems are easy to strip out of the narrow leaves. Rinse, strip and tear into little pieces—you’re ready to cook. If you followed the second step too literally put your clothes back on and get “cookin”. Don’t forget to plant a little mustard. We like to mix it with other greens for a bit of spicy kick. The standard varieties are green, but there are red and purple varieties that are even spicier and gorgeous in the flower bed. 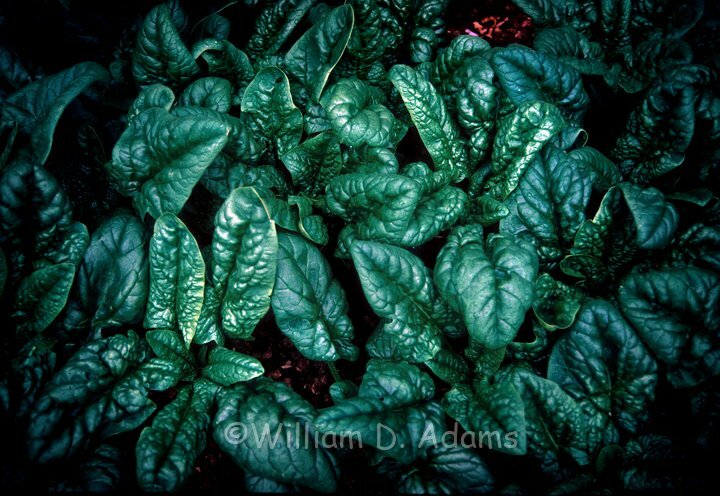 Spinach can be difficult to grow because it likes a deep organic soil, but fall is the time to try it (it bolts to seed in the spring) and modern hybrids like Melody are more vigorous. 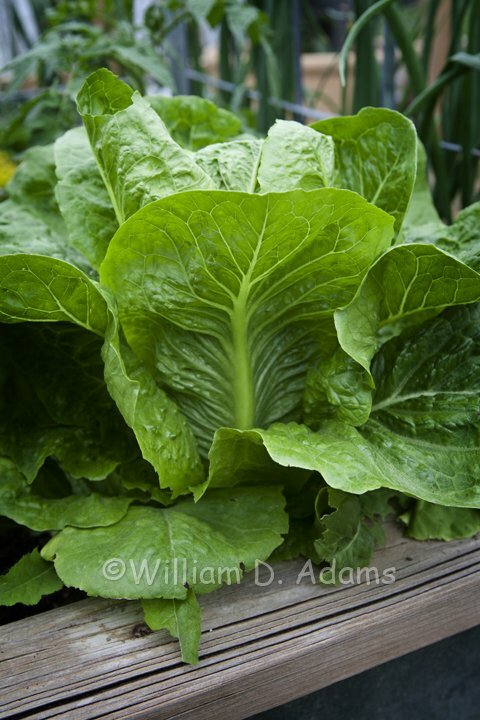 Virtually any of the romaine or leaf lettuce varieties will thrive in the winter garden. A hard freeze may take them out or damage a few leaves but an old blanket or frost protection row cover will often “save the day”. 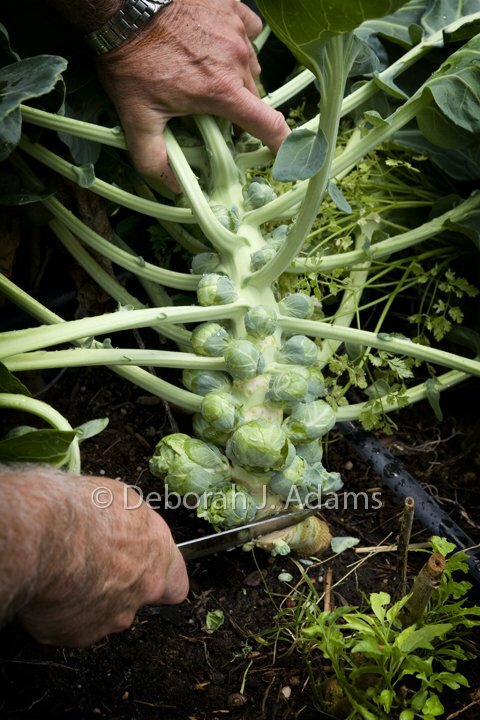 Cabbage, Chinese cabbage, Pac Choi, Brussels sprouts (baby cabbages), kohlrabi (stems & leaves)—the list goes on and on. 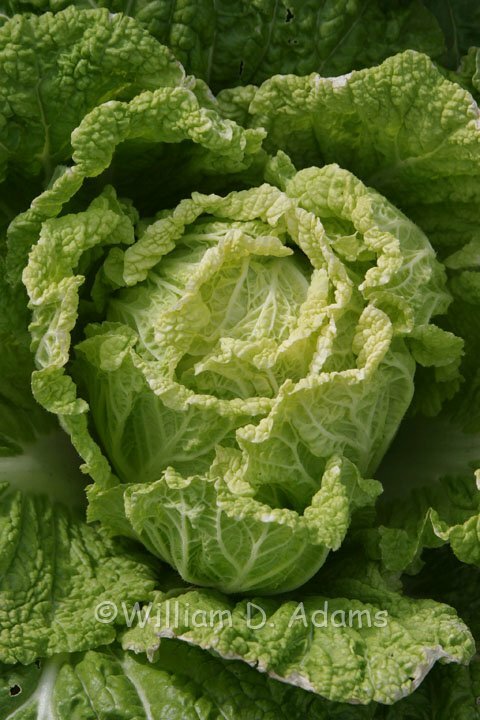 All of these can flourish in the cool season garden but if early hybrids are available (especially with cabbage and Brussels sprouts) go with them over mid-late season varieties. 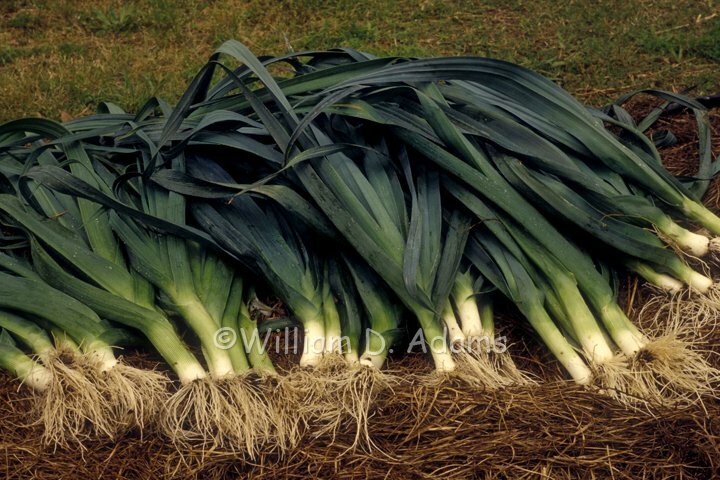 The onion family thrives in the winter garden and in most areas of Texas, even the hardest freeze won’t take them out. 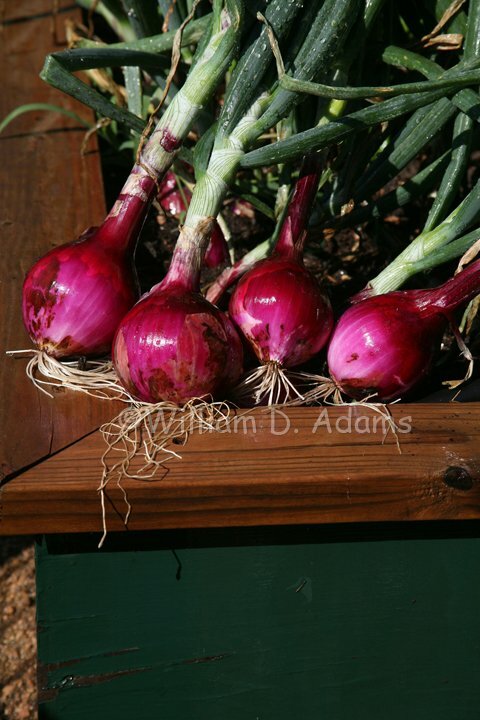 If you want bulbing onions, pick the short-day varieties. Texas Super Sweet plants are usually available or Burgundy is a good short-day red variety. There are multiplying shallots that grow abundantly here. 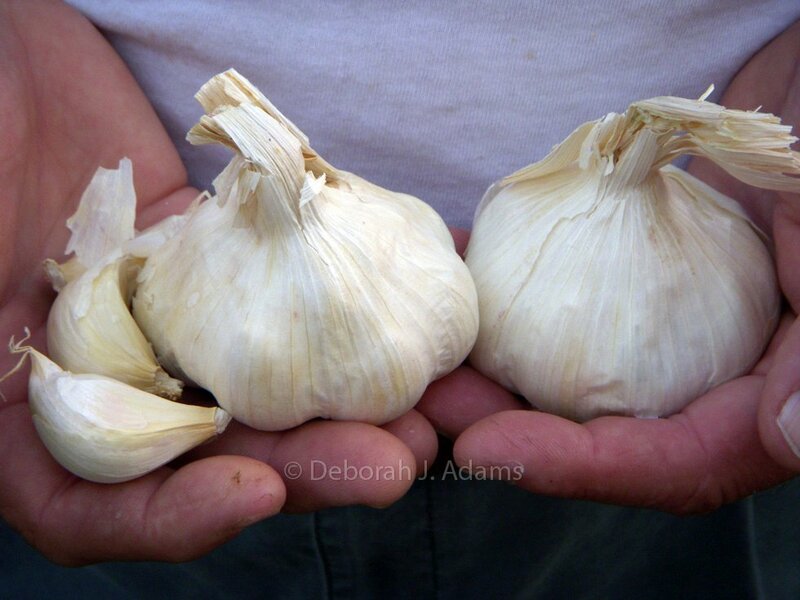 Garlic and leeks are easy to grow too. 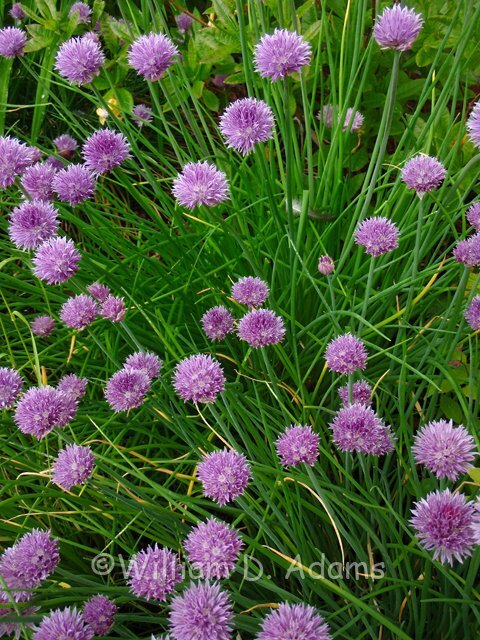 Chives are in the onion family and they are just one of many herbs that thrive in the fall/winter garden. 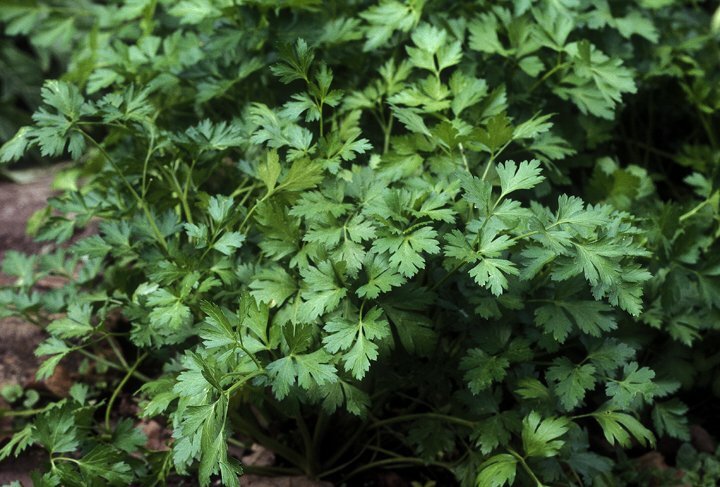 Also plant parsley- chefs prefer the Italian flat-leaf varieties like Gigante di Napoli , arugula, oregano, thyme, dill, fennel (Swallowtail butterfly larva love it), chervil, coriander, etc. We can grow a greater variety of herbs in the cool season garden than in the summer garden. 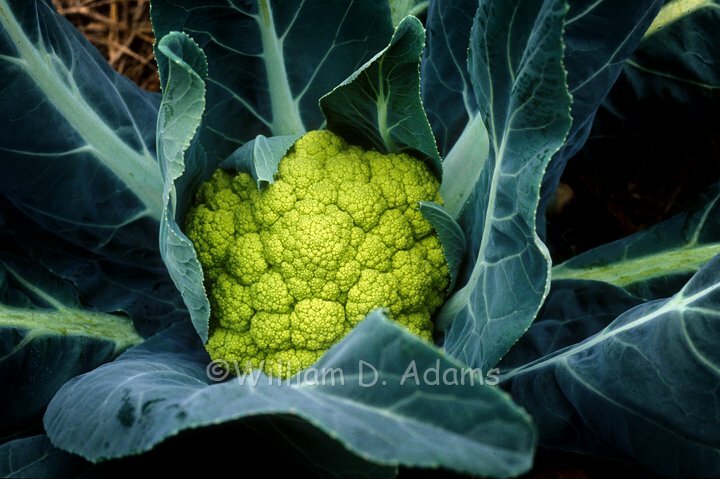 Broccoli and cauliflower are favorites in the Adams cool season garden. They are so good fresh from the garden with real butter and cheese sauce. 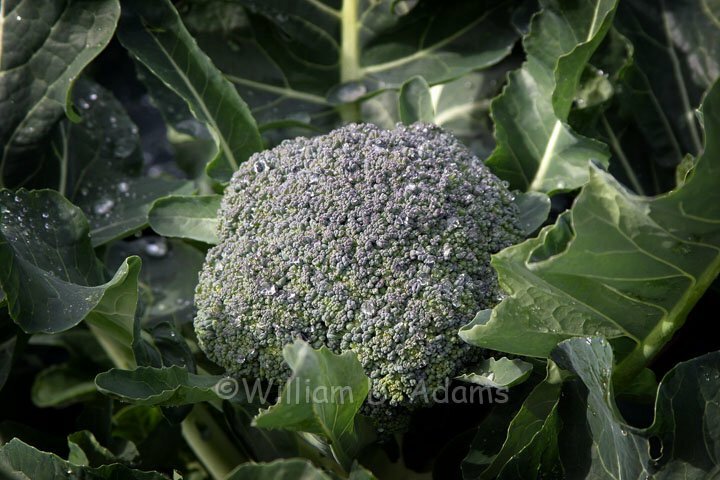 Try the Gypsy variety of broccoli. 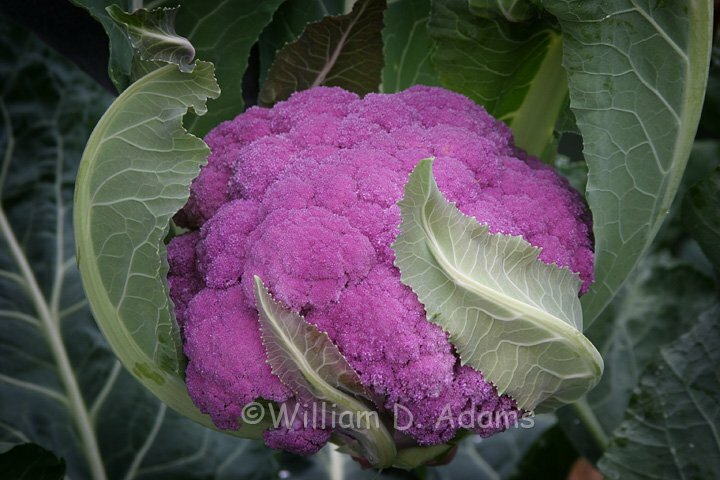 It seems to be sweeter than most (don’t forget the side sprouts) and most any white cauliflower will do but for a change of pace try a lavender variety like Graffiti or a green cauliflower like Alverda. 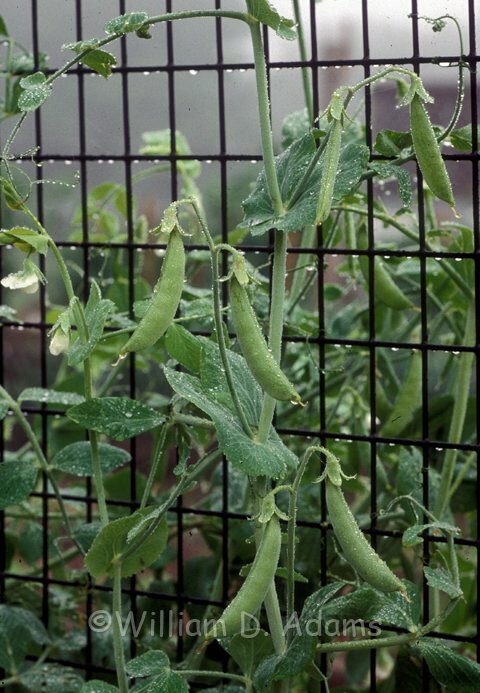 Snow peas or the Sugarsnap type (pick when peas are full size) can often be a success in the fall or early spring garden. They need a trellis and can be planted as early as August and again in January (Central and South Texas) and most years you will be rewarded with a delicious and high value crop. In a hard winter you may have to replant but it’s a crop worth the effort. One final thought—have you noticed that when you want to make a pot of stew on a cold winter day you need a stalk or two of celery. So you go to the store and buy a bunch of celery, use two stalks and find the rest in the bottom of the fridge next spring. 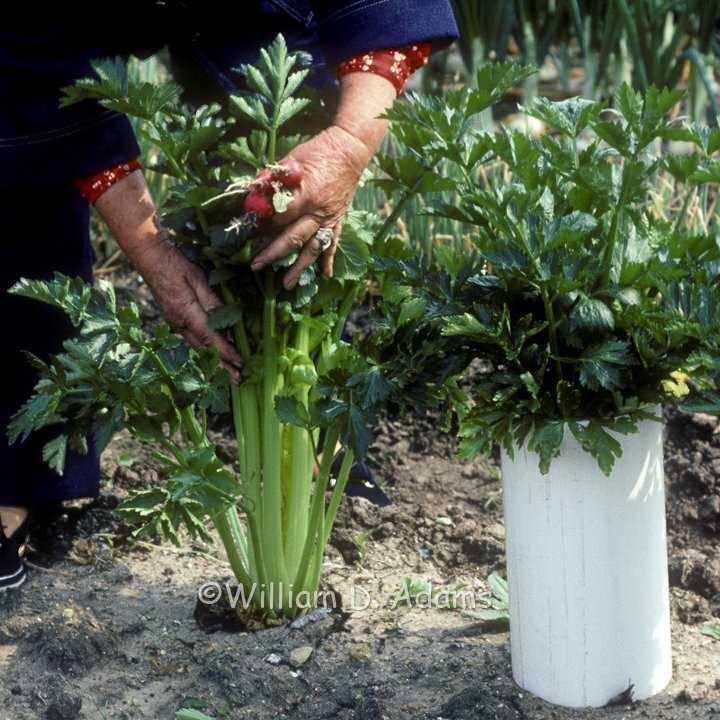 It’s easier to plant a celery or two, harvest a few stalks as needed (it’s also good diet food) and compost what’s left next spring.